Last weekend, I met a family friend who knew that we recently celebrated grandma’s 99th birthday. She was looking forward to grandma’s 100th birthday party next year and said that even if she was not invited, she will still come. I assured her that she’s our guest because just a day ago, my cousin called from Sydney to say that a group of his friends were ready to fly here for the celebration. Cousin Malcolm’s Aussie friends feel that a 100th birthday is so rare that they must be part of it. He reminded me that we should work on the event at least six months ahead and to start sourcing for a venue, organize the guest list and think about how we can make it a grand celebration. This reminded me of the privilege I had to dress grandma up for her recent birthday party. With the help of the maid, I changed grandma’s clothes, powdered her face and put on her pearl accessories. At 99, grandma’s mental health had deteriorated so much that there are days when she can hardly recognize any one. That was one such day and as I kept up my one-sided chat with her, she gently smiled and cooperated as best as she could. It was a very special time for me and before I presented grandma to the others, I gave her a warm hug and felt a sad rush of emotion because she could no longer reciprocate my hug. 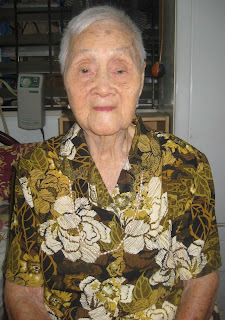 For almost 20 years grandma lived with us in Johor Baru and our family planned our lives around her as she gradually aged and needed more attention. 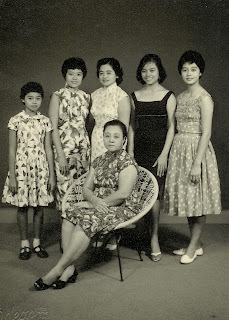 Because my parents are also advancing in age, my aunts in Kuala Lumpur took over as grandma’s primary carers. This proverb was painfully brought to mind again on 13 July when I received feedback from a reader, responding to my article, “Painful visits to the photo studio,” published on this page on 16 May 2011. 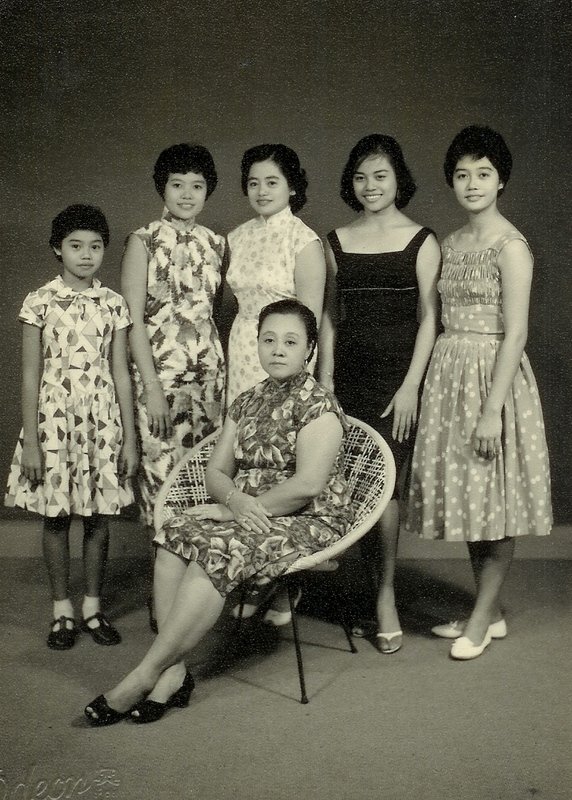 The reader said she too has family photos like ours, with her sisters and only brother, smiling happily into the camera and ended the message with her best wishes and hopes that we never encounter the likes of her brother in our family. That’s because their brother and his wife drove their father out of their home and she saw their father spend the last four years of his life, sad and disillusioned with his son. Incidentally that day was also my brother’s birthday and our family was together, having our usual dinner celebration. As we were sharing family joy and unity, I had sobering thoughts about families who are struggling with issues on their elderly care and being locked in legal fights. It made me wonder if these people realise that they too will eventually age and their children are learning from their example to forsake their elders and create hostility among siblings for a larger chunk of money. It’s ironical that filial piety is practiced in our Asian culture and the younger generation makes it a priority to pay respects to their elders at each celebration of Hari Raya, Deepavali and Chinese New Year. Also in Asian society, the birth of a son is more important because they carry on the family name. But very often the sons neglect their aging parents because they are simply selfish or are under pressure to please their wives. Granted that most modern women have to juggle fulltime careers and families and may not have energy to manage the elderly but when children and grandparents live together, they mutually benefit each other. Youngsters learn to be patient and helpful and learn from the elders’ rich experience while the elderly can age with dignity. 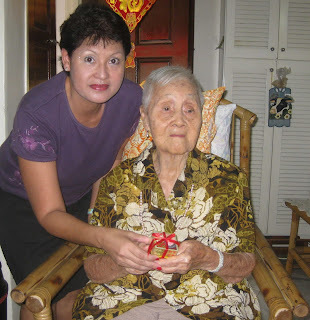 Before grandma’s gradual mental deterioration, she had a vivid memory that rivaled any electronic database and over the years, she shared with me, many snippets of family history in Johor Baru and insights into the hard life during World War II and the Japanese Occupation. My memories and experiences from living with her at Jalan Ngee Heng as a child and when she was with us in her twilight years are so precious now. This valuable info is safely filed away in my heart and mind and I can draw on this rich resource to add more colour and detail into my Johor stories. I’m glad my parents showed by example that we ought to love and cherish our elders and now showing care and compassion comes naturally to my siblings and I. It may cost a little more time, effort and even sleep and money, but it matters that our elders are not cast aside to die in indignity. Bryan said: An exemplary article on elders - true this is how they are treated, and I like the Malay proverb! Rose said: Your article is so touching! I hope readers who are not doing their part to care for the elderly will be moved. Siblings who are not doing this duty and not to simply "wash their hands" of their responsibility. The carers do need support and a break [respite] every now and then. Malcolm said: A most penetrating and poignant article!! You should have written this 20+ years ago but then again, it is never too late. Hopefully, your honest statements will not go unheeded but there is a wise saying "....leopards do not change their spots"? 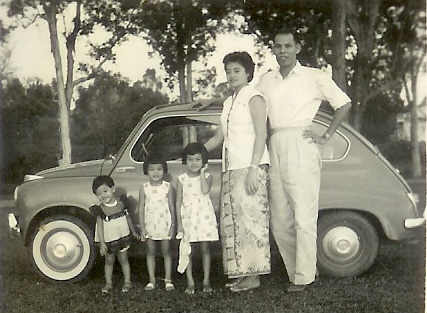 I was born in Kampong Perigi, Yan, Kedah and moved to live in Johor Baru for the past eleven years. I’m the eldest son in our family, with a sister and younger brother. Since young, I was aware that our father, a teacher by profession, is gifted in various arts. Father could act, play musical instruments and draw beautiful portraits. 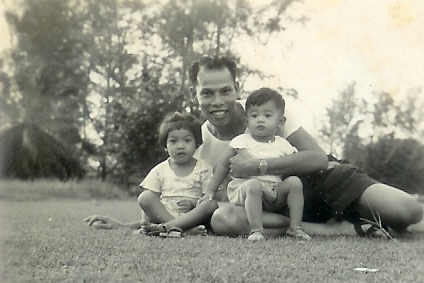 I remember how father could draw portraits just by referring to photos. On National Day and other special celebrations, my father who’s now a pensioner, is still often invited to recite poetry. I guess I inherited some of these gifts from him because I also enjoy reciting poetry and acting. In the past two years, I took part in a poetry reciting competition organized by the Dewan Bahasa & Pustaka and another on the 50th year anniversary of the National Language Campaign and clinched the top prizes. Acting comes quite naturally to me so over the years, I was involved in several local productions and had the honour of being named, Best Actor, several times. 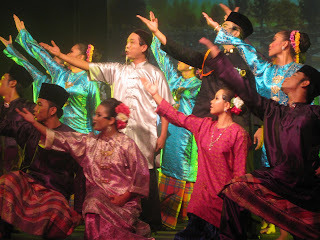 In the 7th Johor Baru Arts Festival last year, the Johor Society for the Performing Arts worked in collaboration with Alpha Consult and Lee Wushu Arts Theatre to present a musical drama, Bumi Berlantai Permata, or the Bejewelled Land. This musical theatre production tells the story of the beginning of modern Johor in music, dance and drama by cast of actors, dancers and musicians. I played the role of one of Johor Baru’s founding fathers, Wong Ah Fook. To prepare for this role, some Chinese friends from Lee Wushu Arts Workshop coached me in the art of speaking Bahasa Melayu with an exaggerated heavy Chinese accent. It was very challenging but I think I gave a credible portrayal of a Chinese immigrant. 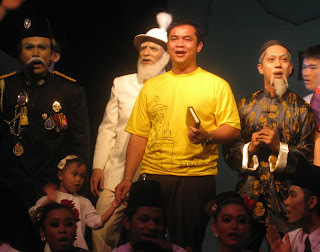 In the revised version, Bumi Berlantai Permata II, staged in the 8th Johor Baru Arts Festival, director Dean Manas initially cast me in the role of Fredrick Weld. I know he wanted to give me a fresh experience in a new role but when we started reading the script, I ended up speaking with a Chinese accent instead of an English one. After several attempts, Dean Manas decided that I should revert to the role of the lead Chinese character. Rehearsals were tough because the cast, made up mostly of amateurs, had day jobs and we could only get together at night. Through sheer passion and commitment to the art, we rehearsed our various parts, first separately and then together, usually into the wee hours of the morning. I suffered seriously from sleep deprivation but the love for the art just drove me on, especially as we would also be presenting a gala performance to HRH the Sultan of Johor. The play, written by Rahimah Muda and directed by Dean Manas with co-direction by Lee Swee Seng and Fairuz Embun, had some interesting revisions that included a change in the lead Chinese character to Tan Hiok Nee, the leader of the Teochew clan. I happily accepted this role and thought it was going to be easy since I already had experience playing the part of a Chinese immigrant. On the other hand, I also wondered if there was no longer any challenge because I had nothing new to learn. Incidentally, this year’s arts fest was organized in collaboration with the Tan Hiok Nee Heritage Walk Committee with a series of supporting events held on Tan Hiok Nee Cultural Street. When I realised that my character’s name was the same as this road, I was curious and started to research my role. It was an emotional journey for me as I went on a guided tour of the Johor Baru Chinese Heritage Museum and discovered for myself, who my character really is. Finally I understood that part of Johor history where prominent kangchus developed Johor’s economy through planting pepper and gambier. In 1844 Tan Kee Soon, leader of the Ngee Heng kongsi or society established the Tan chu kang in Kangkar Tebrau with a large group of workers. He was succeeded by Tan Hiok Nee in circa 1864. This society played a significant role in settling the unrest in Muar which helped Temenggong Ibrahim become the ruler of Johor. I was filled with awe for Tan Hiok Nee who was probably the only Chinese appointed to the office of Major China in Malaya and was a State Council member with a role in government. When the director told me that my character should speak and sing in Teochew dialect, I was plagued by the worse fears but challenged to learn something new. In three days, I picked up this dialect with strange inflections under the patient tutelage of Tan Chai Puan, Director of the Teochew Eight Districts Association and perfected the art of singing Teochew lyrics with the help from my colleague, Lim Kee Yee, Senior Assistant Superintendent of Customs based at Johor Customs Tower. 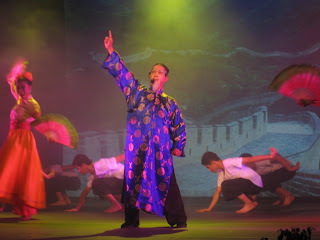 I never knew I was capable of it but as the audience applauded and responded positively to my performance, I attributed my achievement to these friends including Lee Swee Seng, Wushu instructor and artistic director of Lee Wushu Arts Theatre, who taught me the right posture and gait, and Miss Chow Pei Foon, stage manager of Lee Wushu Arts Theatre, who helped me hone my Chinese theatrical skills. I’m just humbled by the privilege to portray such a great man in Johor’s history and glad that I have helped the younger generation to be more aware of their proud heritage. 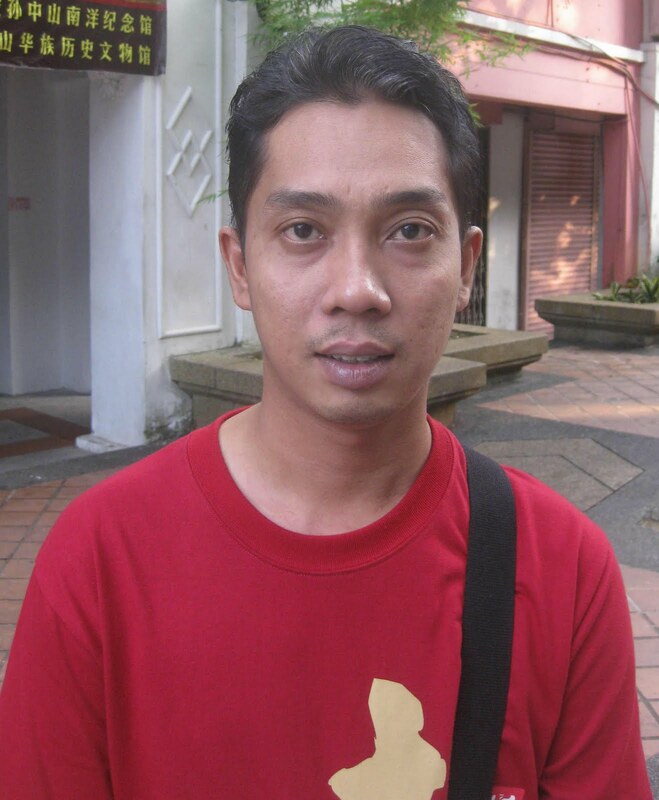 Note: Shamsul Akmal Md Ilias, better known as Suratman, 37, an award-wining artiste with a passion for the arts, has a day job as an officer attached to the Passenger Section of the Customs & Excise Department in Johor Baru. In the days before security companies were common there were Sikh night watchmen who would sleep overnight in front of banks and business premises. These watchmen are also synonymous with their charpoys or Punjabi string-beds which they bring to rest along shop corridors. And in the morning, the watchmen would carry their beds balanced on their heads, away for storage until they went on duty again at night. 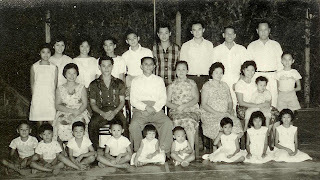 My earliest memories of the charpoy was one I saw on the corridor of the block of shop-houses adjacent to where ah kong or grandfather used to live at No. 154 Jalan Ngee Heng. I remember there was a Sikh family who lived upstairs at the far end of the block. I often saw one of their male family members resting there and I even sometimes spied him combing out his long hair and coiling it into a bun on top of his head. When I asked my mum about the charpoy, she surprised me by revealing that a Sikh family used to live in ah kong’s house as caretakers while he was transferred to work in the Land Office in Muar. 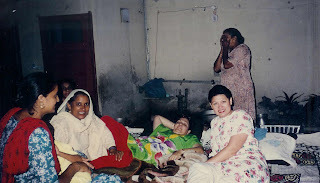 After ah kong and his family moved back to their home in Jalan Ngee Heng, the Sikh family continued to live downstairs for a while before they shifted out. 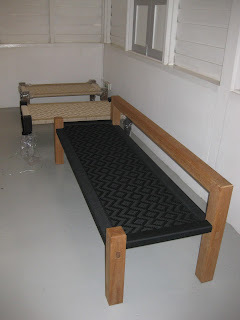 Mum said there was a charpoy in the front porch where the Sikh man used to rest on as a day bed and slept there at night! This is a very interesting revelation because it adds to my own fascination about the charming charpoy. 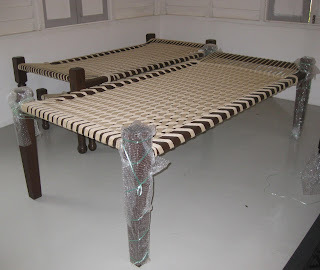 This traditional piece of furniture is made of a wooden frame and legs with a bed woven of ropes made from jute. 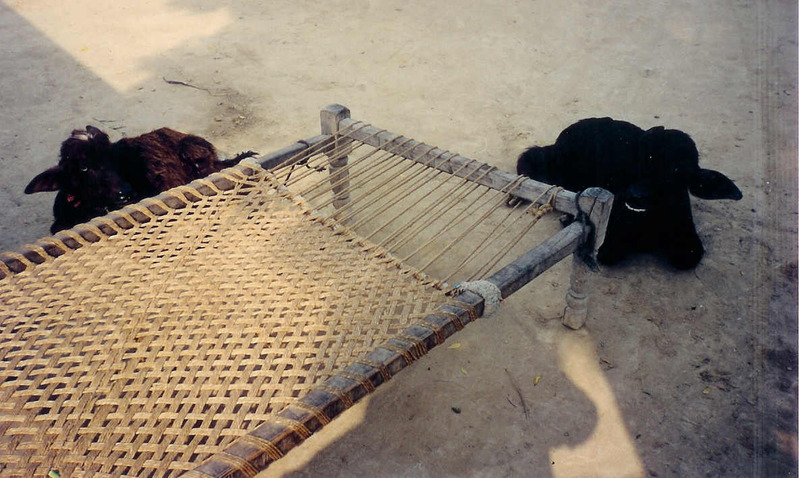 In India and Pakistan, the charpoy is an important part of their lifestyle because people use it to sit on and as a bed. I learnt this first-hand when I stayed with a Sikh family, relatives of my friend Kuldip, in Chandigarh, the capital of Punjab and Haryana. These versatile charpoys are used indoors and outdoors or on rooftops and it was a common practice to invite guests to sit on it. On a visit to the home of my host’s relatives in a nearby village, I was amused when I was offered a charpoy to sit on and I did as the proverbial Romans did and joined the ladies on this communal bed. It was cool and comfortable to sit on and I marveled at that remarkably strong charpoy which took on our substantial combined weight! In another relative’s home, they had upgraded to a mattress double bed but it was odd that this was the central piece of furniture in the front hall. 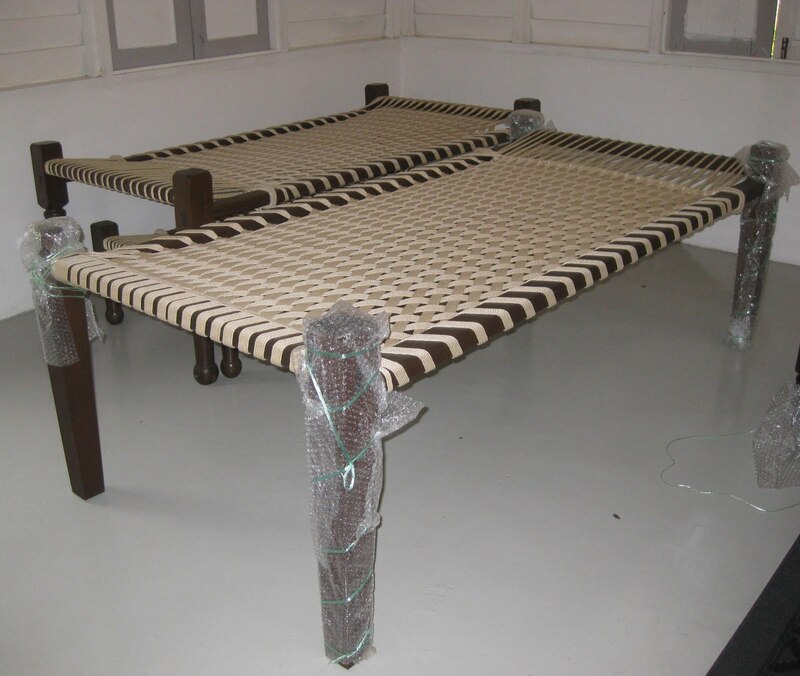 When I was invited to sit on it, I hesitated because I did not fancy sharing that bed which already had several people lounging on it. Sensitive to my culture shock, the host found an armchair and when it was offered to me, I gratefully accepted. For hundreds of years, generations of families have been using this versatile and functional piece of furniture. 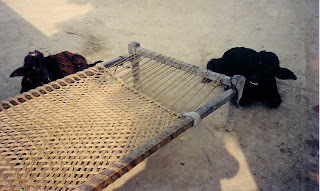 When I walked through the village, I noticed how the charpoy was sometimes even used as an anchor to tether young calves and prevent them from wandering off. And when not in use, the space-saving charpoy can be easily stood up against the wall. 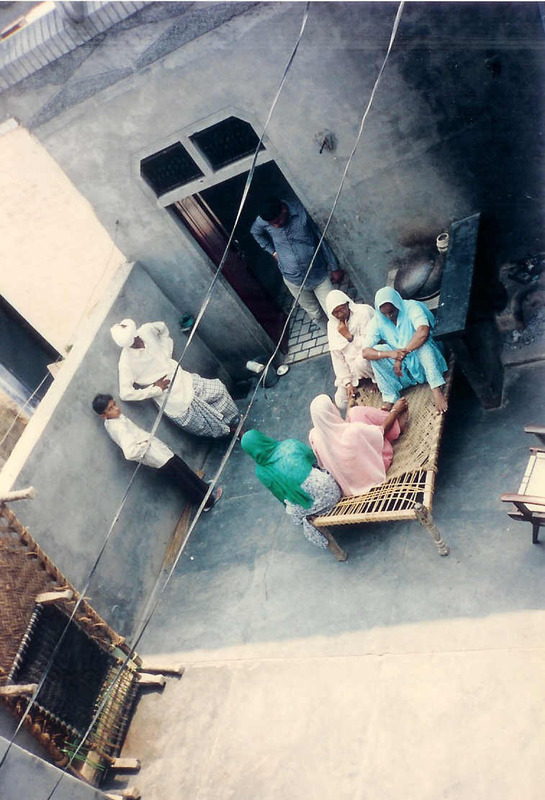 I was convinced that before I left Chandigarh, I must have the experience of sleeping on the charpoy and when Kuldip shared my idea with her aunty in their own language, I read her body language as she responded in horror. It was summer and the men usually sleep outdoors but it was unthinkable for me to want to sleep outside too. But as Kuldip explained that I’m a writer and must have that experience, her aunty finally relented and decreed that, that night all the men will sleep indoors while the ladies sleep outdoors. Aunty arranged a row of charpoys in the courtyard and made them more comfortable with several layers of quilts and sheets. I remember it was a humid evening and some women neighbours, probably curious about this crazy writer, turned up to join their chit-chat on the charpoys. I was glad that I went to bed armed with my socks and a small towel because it got progressively cooler in the night and I used the towel to wrap my head and face to keep out the chill! My charpoy was sandwiched between Kuldip and aunty’s charpoys on either side of me among her daughters in that row. It was an unforgettable experience on many levels but the most memorable bit must be my rude awakening by a megaphone that was blaring wedding songs (I was later told) from a nearby temple. While my head and face was virtually turbaned by my towel, I managed a peek and won’t forget that cloud of flies that rose from me when I moved! Morning also brought out the pesky flies that abound in that agricultural district and no amount of swatting could keep them away. As I reluctantly dragged myself out from that cosy cocoon on my comfortable charpoy, I was ever grateful to Kuldip and my Punjabi host for my priceless charpoy experience. 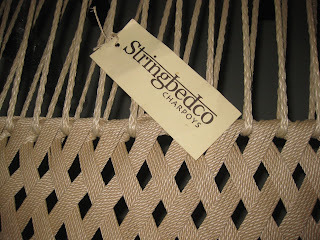 In February 2011 while I was at the Thistle Resort in Port Dickson, I told my friends there that I was trying to track down Stringbedco, the charpoy maker. They spared no effort to help me locate their showroom in Telok Kemang and added it into the itinerary of our tour of local places of interest. The showroom was open only on weekends and public holidays and since that day was a weekday, a visit to the showroom was by appointment only. 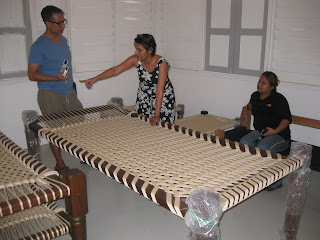 At that time, the showroom was under renovation but after several phone calls, I was thrilled that Neena Gill of Stringbedco, graciously welcomed my friends and I to drop by. From the coast road, we spotted a signboard which read, “Tall Trees Garden” and the sight of a small wooden frame woven with strings – a mini replica of charpoy – confirmed that we were at the right spot! Later when Neena showed off the plants in the rear garden, it was easy to see how this address got its name because the compound was fringed by towering trees. Neena was quite apologetic about the mess because the showroom was just repainted and her charpoys were not displayed to the best advantage for our viewing. All the same, she showed us some excellent samples of Stringbedco products. I was shipped off there to do Pre-Med post-MCE, and after the initial hiccups (cultural differences, cutting of apron strings, having to eat chapatis instead of rice, etc), I actually grew very fond of the place. Haven't been back in nearly three decades and I've heard it's changed a lot, like most of India has. Maybe I'll take a detour from my annual sojourn to Kolkata this year and go back in time to relive the heady days of Abba and Boney M in Le Corbusier's city-before-its-time. Wearing a black T-shirt and blue jeans, Master Siow Ho Phiew, 56, looks fighting fit. Sporting close-shaven hair and a flowing beard, he even resembles a traditional kung fu master or sifu. Siow is in Johor Baru as a guest artiste on Tan Hiok Nee Cultural Street with an exhibition and demo in the art of making of lion heads during the 8th Johor Baru Arts Festival. 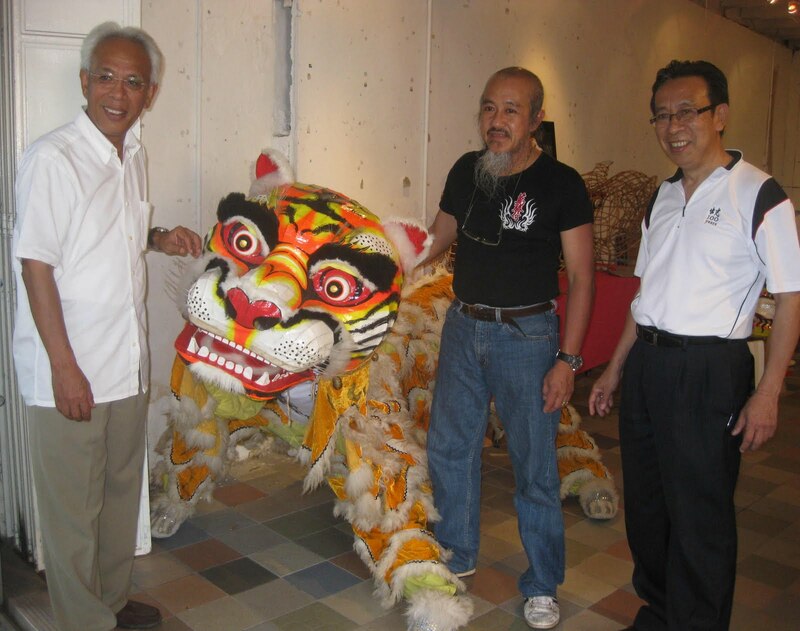 This renowned martial arts master and lion dance exponent has put Malaysia on the map of lion dance circles because wherever there are lion dance troops in the world, there you will find Made in Malaysia lion heads – proudly made by WSH Dragon & Lion Arts – a business founded by Siow. 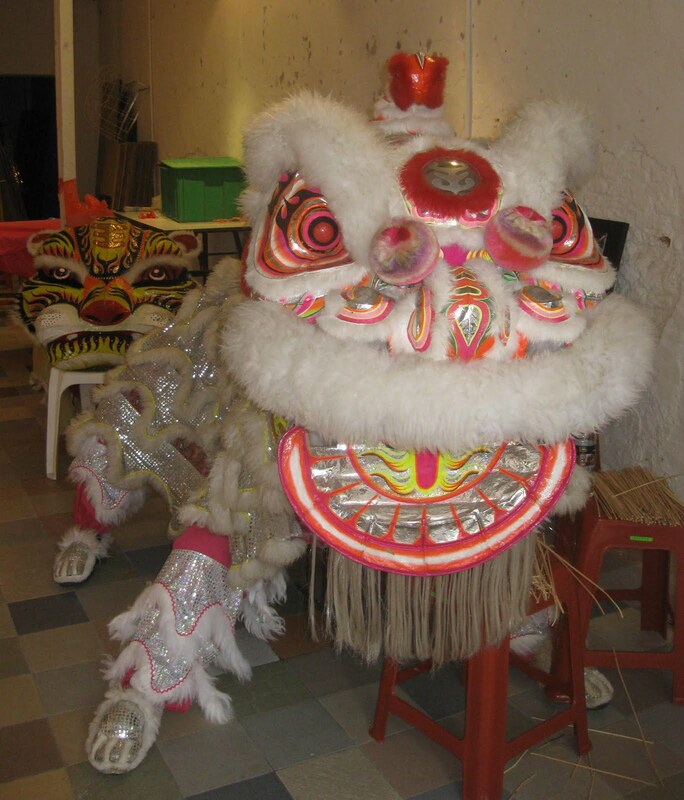 Through his lion dancing skills and special art, Siow is keeping alive an important cultural legacy and contributing to Malaysian culture heritage. 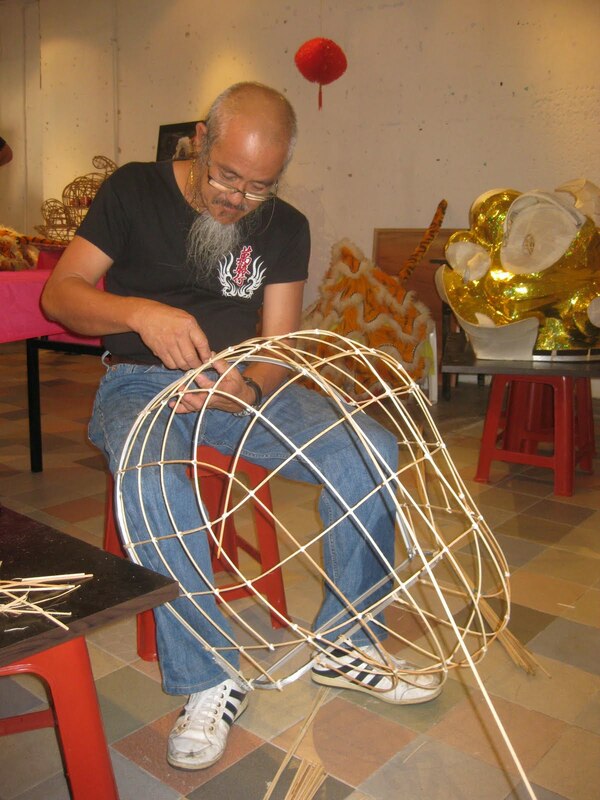 Thirty years of practicing kung fu and training award-winning lion dance troops is evident in his lithe movements as he sat down to demonstrate how flexible lengths of rattan are secured with adhesive tape and fastened onto an aluminum base frame. His sinewy biceps rippled as he lifted the structure up to show how light this version is compared to traditional lion head frames that were made with bamboo strips. These quality lion heads have now gained worldwide acceptance because they are not only lighter but more lasting. Born in Pulau Ketam, Selangor, to a family involved in poultry and fruit farming, Siow was a farmer with a hobby in lion dancing and Shaolin kung fu since he was 18. He became a kung fu master when he was only 24 and at age 30, he gave up farming to focus on his lifelong passion for lion dance. Interestingly, his life-changing decision was made not after years of pondering but after a wild bees attack. “Bees! I was stung all over by bees!” Siow said, recalling the horror and how the serious attack caused him to be hospitalized. After this traumatic experience, he was convinced that he should leave farming for good to pursue his passion in lion dance. 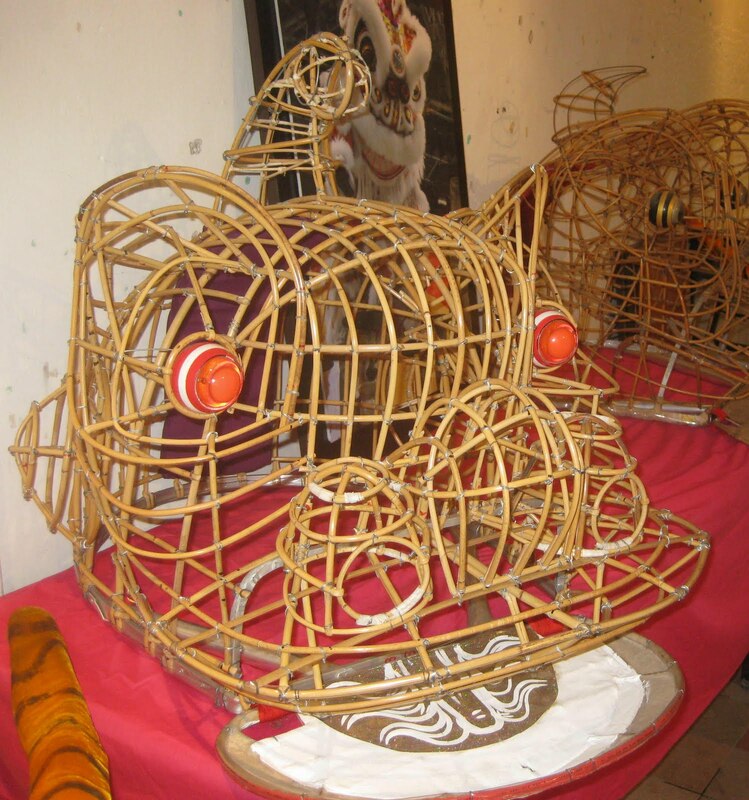 In 1978, Siow and some friends formed their own lion dance troop called Kok Ngai Lion Dance Troop, and because the lion head bought from China was so well used and beyond repair, they decided to create one of their own. He remembers how he took apart an old lion head to understand its structure and materials before he began modifying those ideas and made his own with local materials. After experimenting with various materials, he discovered that using sustainable rattan and self-adhesive tape has inherent merits over traditional methods. 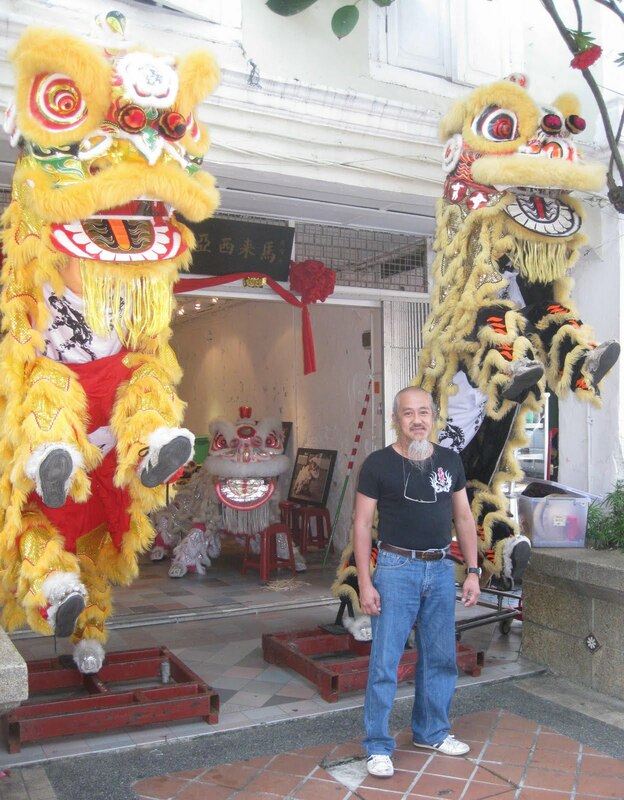 His passion for lion dancing did not wane with his foray into creating lion heads but developed further when he got involved in organizing the first National Lion Dance Championship in 1983. He was also instrumental in organizing the inaugural World Lion Dance Championship in 1984 which continues to have pride of place in the global lion dance circuit as the most prestigious lion dance competition in the world. “You can’t change tradition!” Siow mimicked the words of his critics who were doubtful about his work when the early version of his lion head came out. He recalls boldly challenging them to give him reasons why he should not change tradition if it was for the better. His expertise is often sought because he’s an authority in lion dance and Siow is also a qualified judge for competitions. He has trained various Malaysian lion dance troops like the award-winning Kun Seng Keng troop from Muar, Selangor Kuan Loke, Kedah Hong Tek, Sabah Hong Tek and Sarawak Limbang Hong Tek. Siow also trains overseas troops in Hong Kong, Taiwan, the United States, Australia, Canada and Mexico. “When a lot of people say my lion heads are good, then only will I acknowledge that they are good,” said Siow, still modest about his achievements. Some people commented that if his lion heads were so durable, then he will not have regular business but Siow is confident that his brand, established for fine quality handmade lion heads, will remain popular simply through word of mouth. When his exhibition opened at No. 49 Jalan Tan Hiok Nee, Johor Baru on 9 July, it attracted many curious visitors including JB Arts Festival patron and Member of Parliament for Johor Baru, Dato’ Shahrir Abdul Samad, and Tan Chai Puan, Director of the Teochew Eight Districts Association. The exhibition is open daily at 10am from now till 17 July 2011. 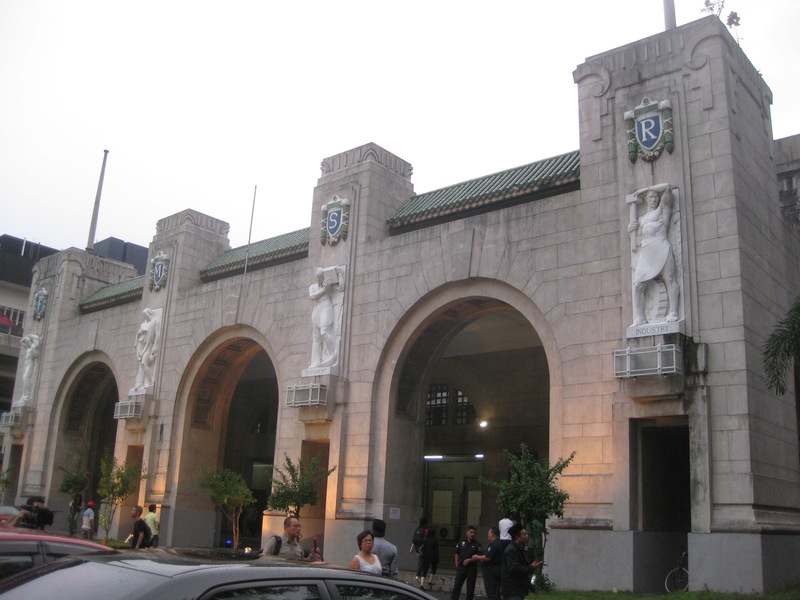 Thursday, June 30, 2011, was a historic day for rail transport in Malaysia as the Senandung Sutera chugged out of Tanjong Pagar railway station in Singapore at 10pm. At first I was sad when Keretapi Tanah Melayu Bhd (KTMB) announced that tickets were sold out. But, my sorrow turned to joy when friends at Tourism Malaysia, Johor office and Iskandar Regional Development Authority (IRDA), gave me a special ticket for a premier deluxe berth on this last north-bound passenger train to KL Sentral. 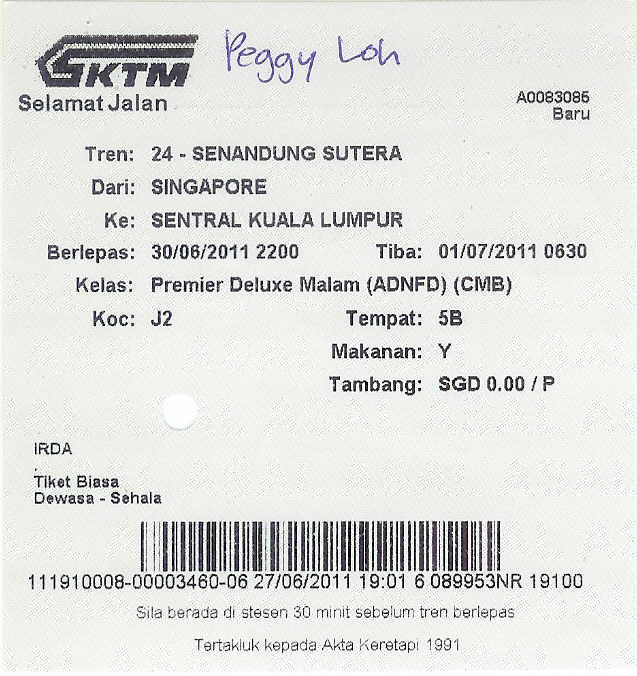 After a flurry of phone calls and text messages, Nizam Abdul Wahid, Deputy Director of Tourism Malaysia – Johor Office, successfully arranged for this ticket through the goodwill of IRDA, and I picked it up from my friend, Nora, at the TM office before heading off to JB Sentral. This ticket gave me the opportunity and privilege to experience railway history and I deeply appreciate this generous gesture. KTMB had invited the media to go to Singapore by an evening train for the celebrations at Tanjong Pagar station and I was among several media friends who boarded the 5.25pm train from JB Sentral. It was free-seating in the coach and a lady and her grandson sat next to me. 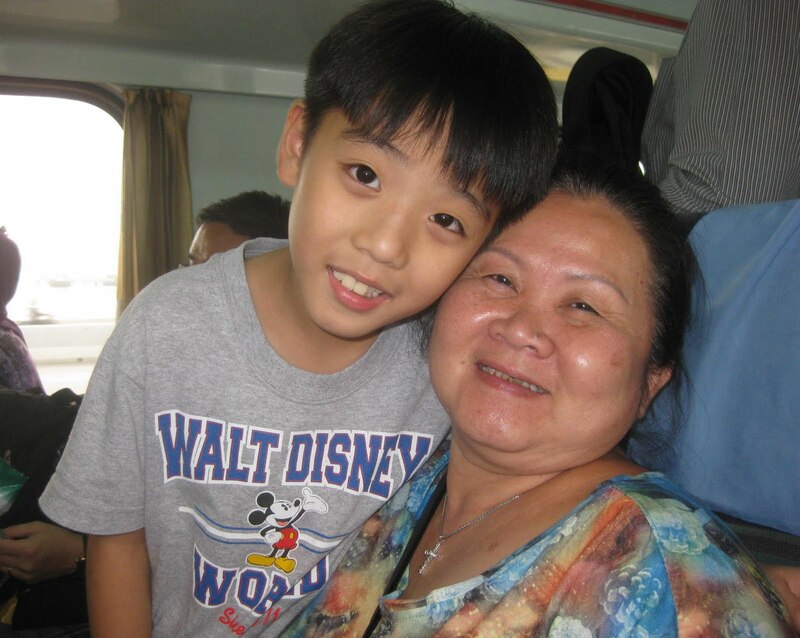 As I struck up a conversation, he helped to translate for his grandma, Tan Poh Tee, 56. Kovan Aw, 9, from Upper Bukit Timah, said his mother and 2-year old sister were seated elsewhere in the coach, on their return journey to Singapore. When I asked why he was not in school, he told me that he went to school as usual that morning but his mother had permission to take him out from school to get on the train from Tanjong Pagar to Johor Baru! 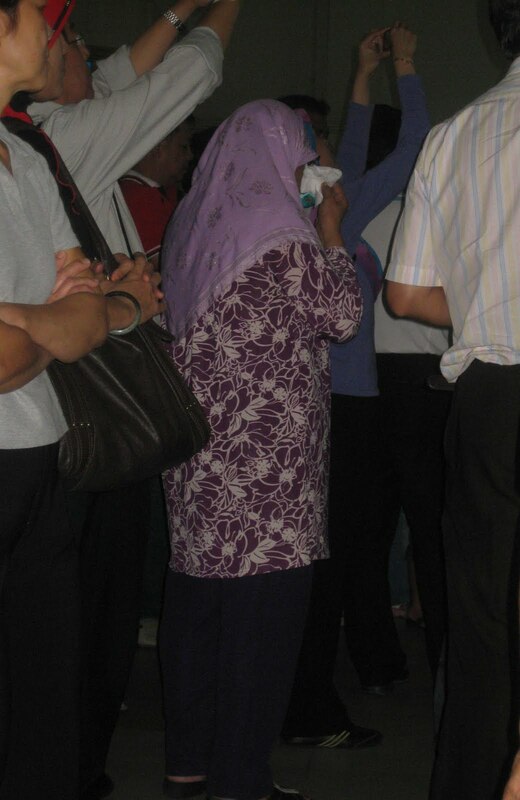 "It is all over," said Norliah Ahmad, 58, sadly as the train trundled into Tanjong Pagar station. Norliah and her daughter, Habibah, who live in Bukit Batok, visit Johor Baru regularly for shopping and entertainment. They were on one of their regular trips and after a hearty lunch, the father decided to go ahead home while mother and daughter enjoyed a movie in Johor Baru City Square. After the movie and shopping, they decided to return by train and were delighted to discover that they were going to witness railway history. If many passengers were endlessly snapping photos on board, the photo frenzy was at its peak at Tanjong Pagar station – on the platforms, outside the fences and in and around the station. Anyone who had a camera feature on their mobile phone was making full use of it. The throng was overwhelming after office hours and a little later, the crowd swelled further with families who came for one last look. 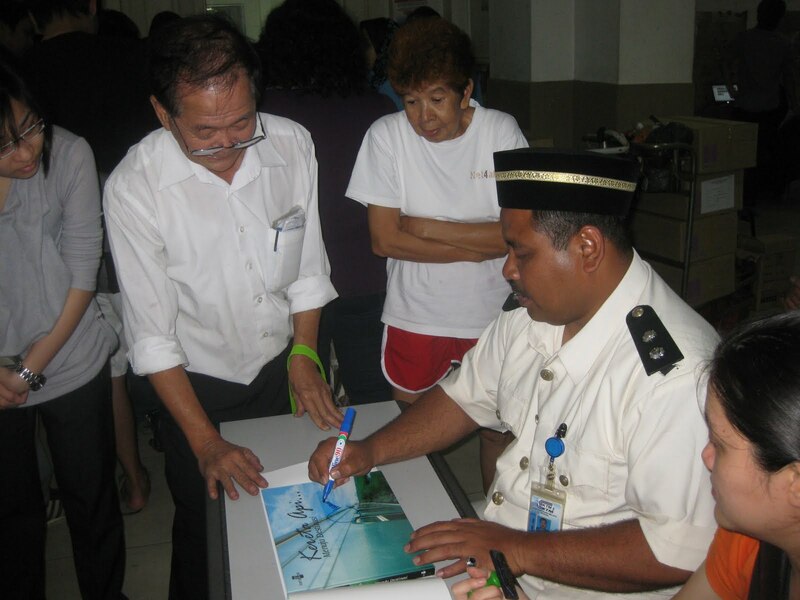 I thought Station Manager, Shamsul Bahari, must be having hand cramps because he was kept busy signing souvenir items as well as train tickets. It was like a busy marketplace in the station as sales promoters aggressively peddled souvenirs at several stalls. Poignant scenes of station staff clocking out for the last time were screened in a documentary and its soundtrack of somber flute and violin music moved many to tears. From where I was sitting, I saw a lady trying to wipe her tears surreptitiously but she finally had no choice and had to reach for a tissue paper. This lady couldn't help weeping! Surrounded by an endless shuffle of people, I soaked in the atmosphere and above the noise, I overhead a girl walking by with a group of youngsters say, “Wo ti yi chi lai,” (Translation: “I’m here for the first time”). I struck me that it was ironical that she finally came to see the station literally at the eleventh hour, just as it was about to cease operations. I guess it’s typical of people to not value anything or anyone until it’s too late or when they are gone. 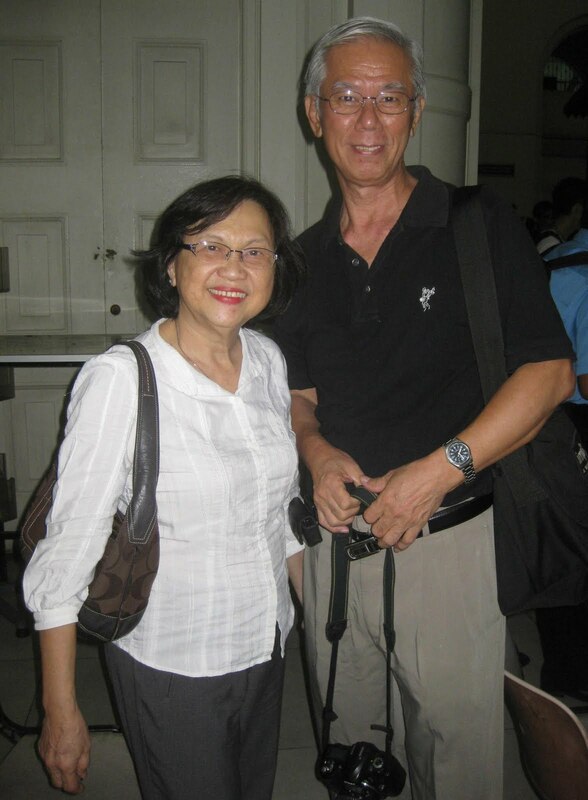 Retirees Teo Teow Koon and his wife, Teo Siew Wah, both 63, said this was their third visit to the station in a month. Teo, a photography buff, said they came in early June to take photos and after buying their tickets online, they boarded the train at Tanjong Pagar on June 13 to the furthest destination possible on Peninsular Malaysia by rail, Penang for a three-day, two-night holiday. They were here again for the final farewell. 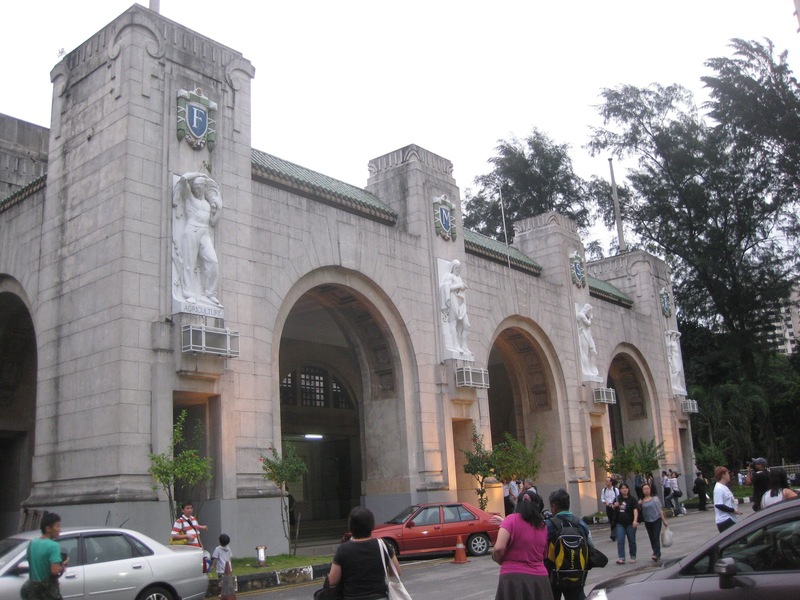 Siew Wah has a nostalgic attachment to this station because, during World War 2, her mother would come and wait for the train which transported goods, including agricultural produce, from Johor. She recalled how her mother would buy tapioca from the dealers at the station and resell it to support their family of five children. Her mother passed away in 2003 at the age of 94. I was unaware of the last call to board my train until I spotted Nizam frantically waving to me and I rushed to join the queue to get my passport stamped at the Immigration booth. A KTMB official was on the platform, presenting Certificates to passengers to mark our historical journey and I gladly accepted mine. Then it felt like déjà vu as walked the length of the train in search of my coach because I had a similar experience on a train platform in Chennai, India, a few years ago. The walk seemed endless so I stopped to ask a staff in KTMB uniform and he said, “Depan” pointing me ahead and I was glad to see a “valet” waiting to help me board coach J2. Later in my comfortable cabin onboard Senandung Sutera I met Annie, a Malaysian working in Singapore who travels to Kuala Lumpur each weekend to see her 80-year- mother. 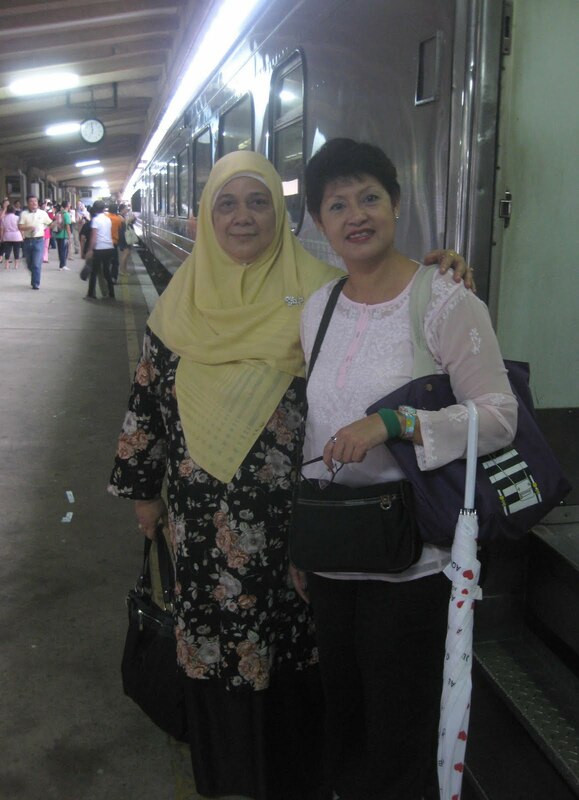 She had not been on a KTMB train since the 1970s and when she heard about the last train out of Tanjong Pagar, she begged her boss to let her go. "Please let me take this sentimental journey!" she said. And, he graciously agreed. 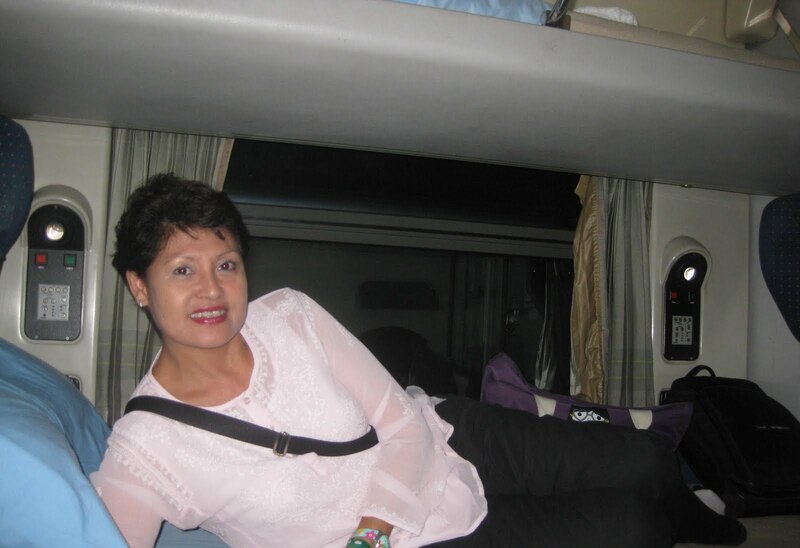 As we shared this special experience onboard the last north-bound train, we reminisced about life, love and family. Our journey and conversation from Tanjong Pagar to Woodlands station was punctuated with loud cheers as passengers waved to pockets of people who lined the tracks to take photos and witness this historical last train. 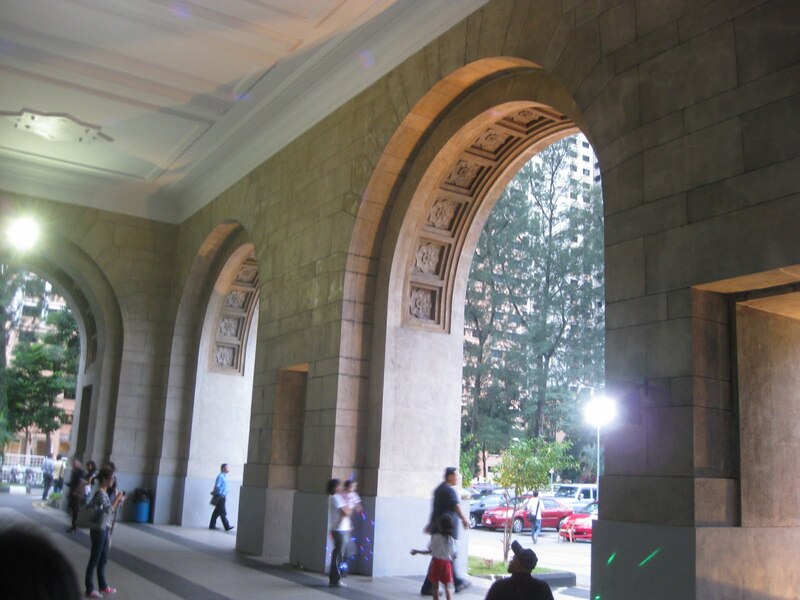 Tanjong Pagar station has served thousands of passengers in the last 79 years and those who used KTMB as a regular commute must now find alternative transport from Woodlands into the city. The romance of railways has a special place in my heart and it was a bitter-sweet experience to be a part of history that once linked the people of Johor with Singapore. As I cherish memories at the close of one chapter, I can’t wait for the next chapter of transport development in Johor and look forward to enjoying a reliable Rapid Transit System between the two countries. AFTER dinner, my dad would usually say, “Vallai palam” with his eyes fixed on the bunch of bananas at the opposite end of the table and Amanda, my niece, would respond by plucking one for him. Friends and relatives, who at first were shocked to hear “Vanakkam” when dad answered the phone, are now familiar with his affinity for the language. For as long as I can remember, dad enjoyed teaching us words like these in Tamil and over the years, our vocabulary widened considerably. 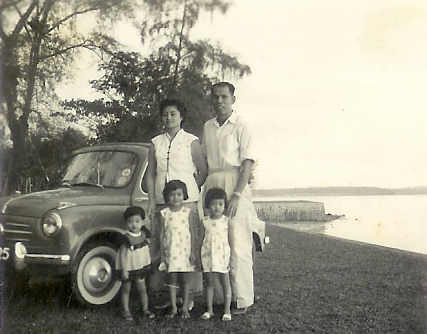 ﻿When dad joined the Johor Baru Senior Citizens Association (JBSCA), he would go regularly to play petanque, a lawn bowling game, and table tennis. With diminishing strength in his knees, dad had to give up his favourite game of table tennis where only recently, he was still able to beat players in their 40s. Then when the Association offered lessons in computer skills, Mandarin and Tamil, dad signed up for the latter. 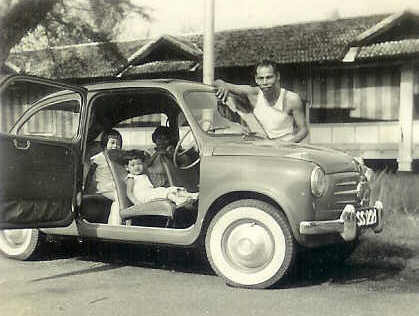 Dad already had a working knowledge of Tamil because he learnt conversational Tamil from his colleagues during his early years working with the Johor Baru general hospital, as it was known then. ﻿He said whenever they finished their rounds on night shifts, he would spend time learning Tamil from his friends. So, when dad joined the JBSCA Tamil class, he was the star student. However, dad stopped attending when the class was rescheduled to Sunday morning, but he continues to diligently practise the Tamil script on sheets and sheets of recycled paper with the help of a book I bought him, Learn a Little Series Tamil that came with an audio CD. If you are compelled to take a second look at my surname to check if I’m Indian, I will tell you that on paper, I’m Chinese. But unlike Chinese families, we don’t use chopsticks at home unless we were having noodles, and if it was Indian food, we will use our hands because we know that it always tastes better when eaten with hands. Forks and spoons are the preferred cutlery in our house and dad had long established the rule that everyone should sit down for dinner together at 7.30pm sharp. We have an ancient grandmother clock that will strike on the hour and every half-hour, and when the clock goes “Dong!” for 4.30pm, dad will be at the dining table, ready for his afternoon tea. This is a legacy from colonial days when afternoon tea was a must and dad must have his hot cup of coffee with either cake or cookies. This is such a daily practice in our home that friends and relatives know that they will be welcome at our table if they dropped by at 4.30pm. After dad’s angioplasty procedure in March last year, he maintains a less active lifestyle and is wise about what he eats. While he enjoys home-cooked small meals, his only indulgence probably is the mandatory serving of Thousand Island dressing to go with his salads. To dad, a salad is not a salad unless it was served with Thousand Island. That’s because the salads offered only came with cream or vinaigrette dressing and we are familiar with dad’s usual gripe about restaurants that do not serve “real salad” with Thousand Island. We often joke about carrying a bottle of Thousand Island dressing along to any restaurant because it is dad’s preferred choice and it looks like we should start doing it. After all, it takes so little to please him. Dad has a great sense of humour and he takes our teasing about him and his fondness for Thousand Island dressing in his stride. I remember Candid Camera was dad’s favourite TV show in the early days of television and now, his daily staple is a healthy dose of a similar show, Just for Laughs. Even if dad’s quirky sense of humour and jokes usually causes a frown on mum’s face, I think it’s important to be able to laugh together as a family. This is typical of dad’s wacky sense of humour and I’m grateful that I can always share a laugh with him. Thanks for the laughs, daddy. Despite it being past the date, it is never too late to say again: Happy Fathers Day! Rose said: "An interesting article. I hope to get an opportunity to converse with your dad in Tamil." Bryan said: "Handsome Mr Loh - treasured photos!" Alicia said: "Thank you for sharing about your dad's sense of humour. I'm going to watch my daughter's face when I tell her I boiling nostrils soup!"